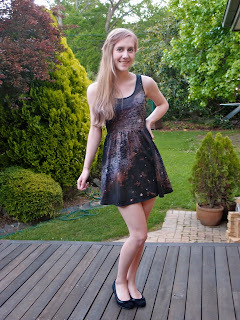 Recently, I've been seeing quite a few tutorials on how to make a galaxy dress at home. I thought it looked fun so decided to try it on my own, and the results turned out great! 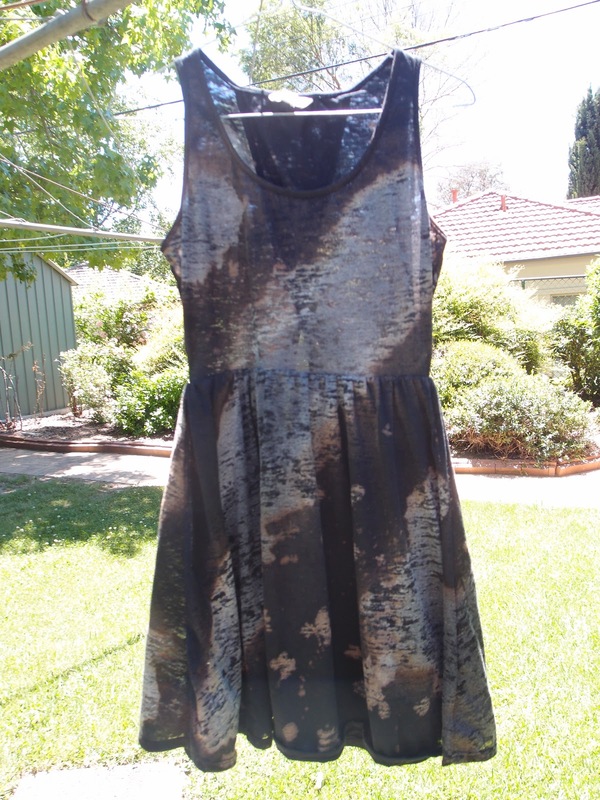 Cheap black/dark blue dress. Mine is a really cheap thin black dress from Jay Jay's. 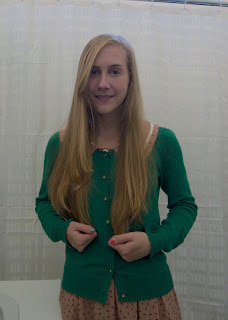 I wouldn't normally wear something this short! But I figured, if I mess it up no big deal. 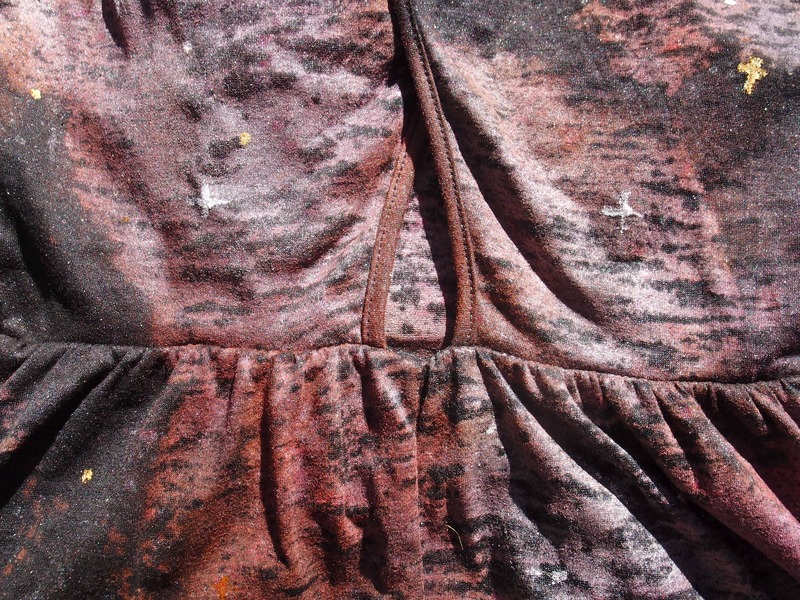 Fabric paints. 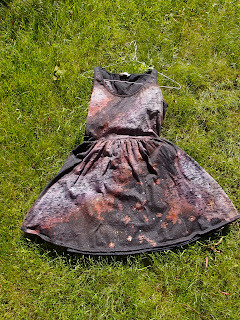 I used both normal fabric paint and some old screen-printing paint I had. I used dark purple, fuscia, red, yellow, gold, silver, and pearly-white. People in other tutorials used spray-on fabric paint but mine worked really well with normal. First lay out your dress on top of some plastic bags, with some inside to prevent things from leaking through. Mix your bleach with about equal parts of water. You won't need much, as this stuff is quite potent. 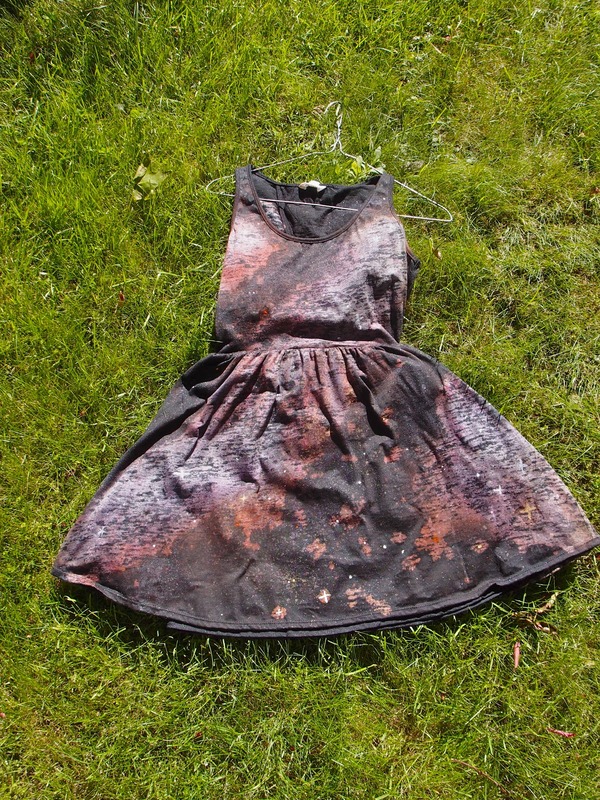 Spray on some nebulas and galaxies with the bleach. The more bleach you spray, the lighter the area will become, so it's nice to have it whiter on the inside of the shape. Wait for it to dry... and you'll see the bits you sprayed more go whiter. 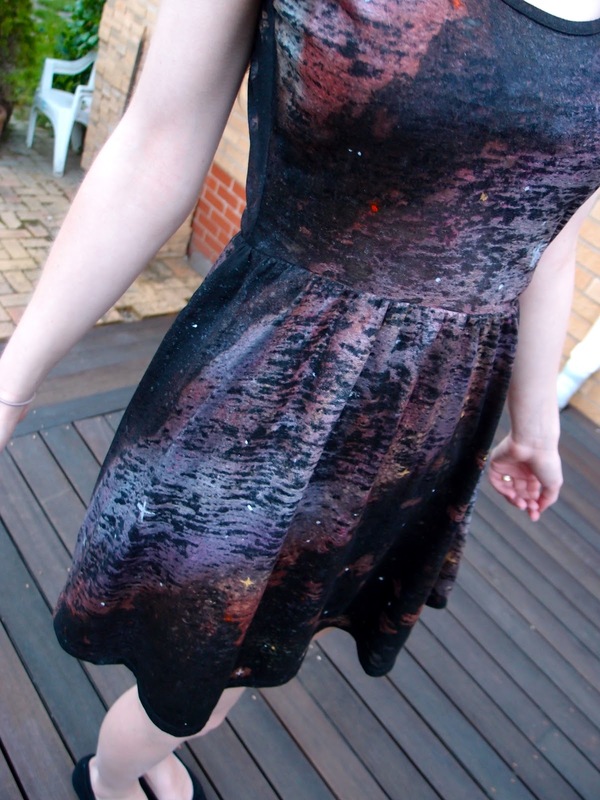 I added some drip drops of bleach to look like little distant galaxies. 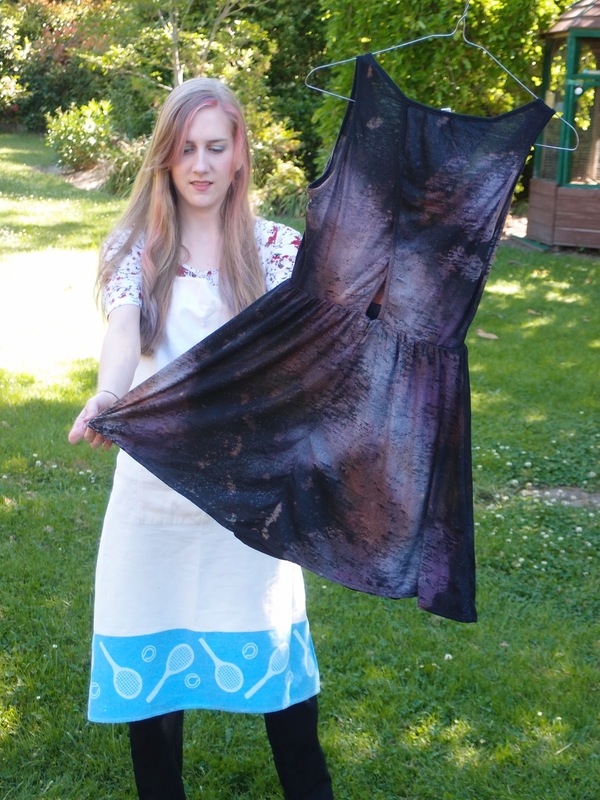 The fabric of my dress was extremely thin and weird so it was kind of blotchy. Now you need to put it through a wash to get all that bleach out! Stinky gross! 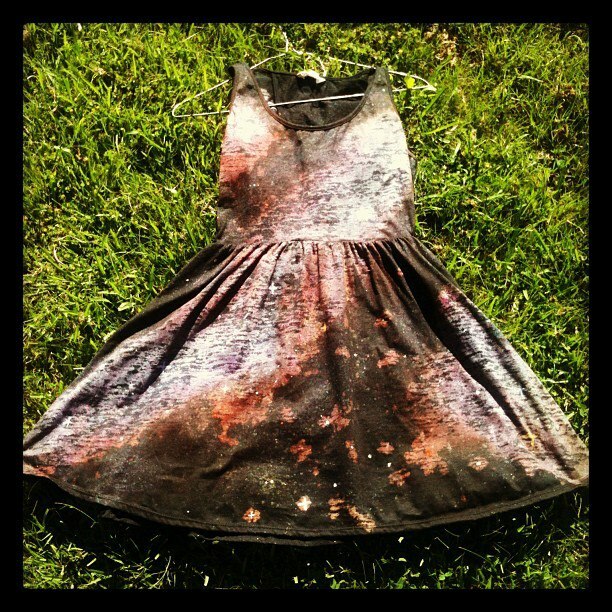 Now get a little bit of paint and put it in the (rinsed out) spray bottle. Dilute with a bit of water to ensure you can actually squirt it through the bottle. It doesn't matter if it's a bit thin, you can layer it up. Sometimes it'll squirt out little blobs of paint, but that looks cool too! I started with the darker colours on the outside of the bleached patches, and moved towards the centre with lighter colours. Make sure you rinse out the bottle each time. It was easiest to hang it on the line for this process. Lastly I sprayed the whole thing with a mixture of silver and pearly-white, which gave the entire dress a gorgeous shimmer. 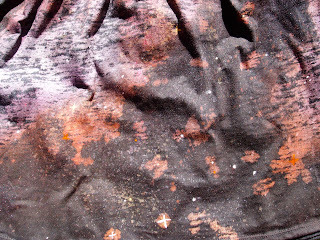 I sprayed lots of that colour on the middle of the nebulas to make it look like there was lots of stars there. 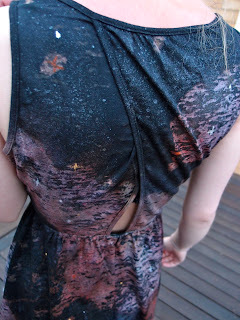 Leave it to dry a bit, and then start to paint on little individual stars with a paintbrush. Some were little crosses and some were just spots. I used gold, silver, red, and pearl to do this. The back of the dress turned out beautiful I think! It has a cute keyhole back. 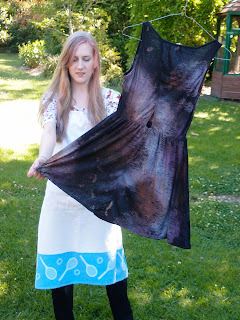 Next, leave until completely dry and then heat-set the paint with your iron according to the instructions on the paint. Probably best to put an old sheet in-between so you don't get a galaxy print iron. But cute! 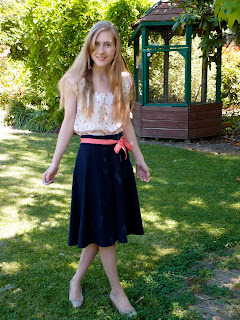 I'm really happy with this and can't wait to wear it to all this Summer's pool parties! Does anyone I know have a pool? Guys? Anyone? 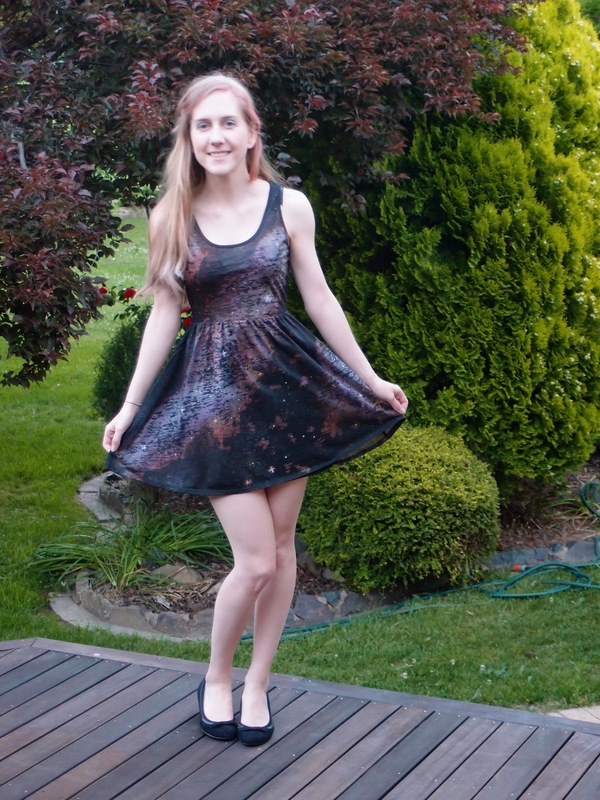 Now I know this method works, I might get a nicer black dress and do it again! It was a really fun afternoon!